I have always enjoyed rainbows, and since I did some studying on them, I realized there are multiple applications. First some history. 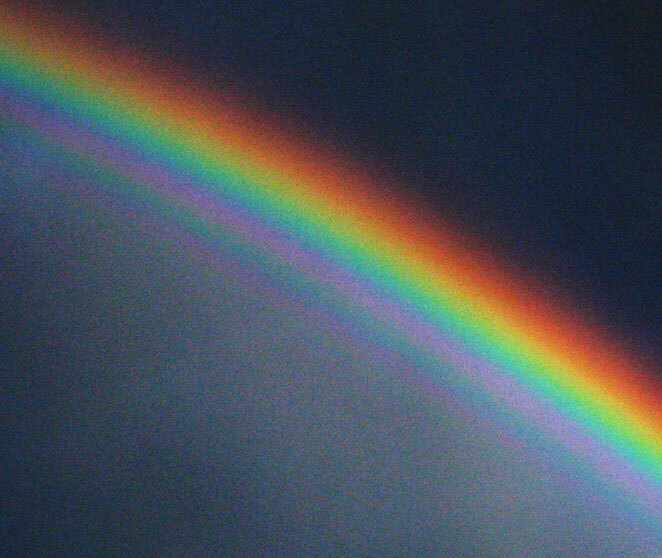 In 1867 Rene Descartes decided to study the properties of rainbows. He did many tests. He found, the lower the sun is to the horizon, the larger the arch of the rainbow… Right at sunset, we would see a full semicircle of the rainbow with the top of the arch 42° above the horizon. However, the higher the sun is in the sky, the smaller the arch of the rainbow. We find that we are seeing only one color from each raindrop. In looking at a rainbow, we are seeing the refracted light contributed from many raindrops. The raindrops lower in the sky give us blue and green light; the drops higher in the sky contribute red and yellow light. 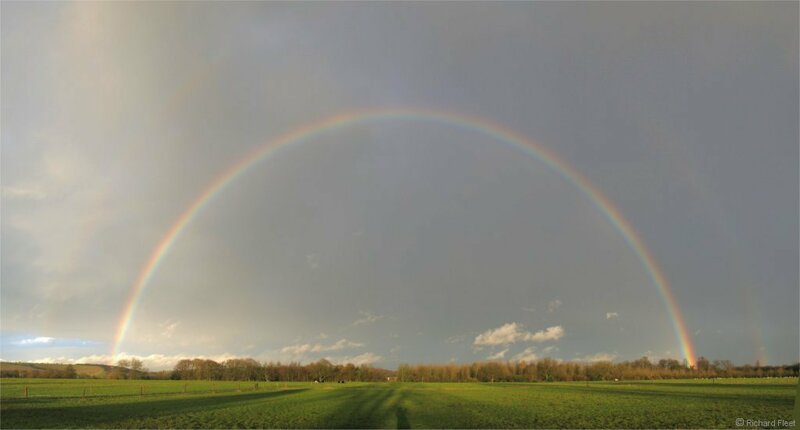 The normal rainbow we see, is produced by one internal reflection of sunlight rays. When you see a rainbow, the sun is behind you, and the rain either is ahead of you, or right on you. Of course, it doesn’t have to be rain, it can be any source of water. Here is a nice example of a rainbow from a waterfall. Where the water spray ends, so does the rainbow. God uses it as a reminder of his covenant with all living creatures not to flood the full earth again. So even the moon can bear witness of God’s covenants, just like the Rainbow. With the moonbow, it's bearing witness to two covenants, which is cool. A covenant with David and one to us for no more world wide floods. We need to remember we never know what tomorrow will bring. The red rainbow is formed at sunset and sunrise. The sun’s rays travel longer paths through the lower atmosphere where they are scattered by dust and air molecules. Short wavelength blues and greens are scattered more, leaving the remaining transmitted light more rich in reds and yellows. The end result, is red rainbows. From this we learn, do not test God & Jesus and ask for signs. Back to the proverbs, they are pretty logical when you remember that to see a rainbow, rain must be falling in part of the sky and the sun must be shining in the other part of the sky. To see a rainbow or red sky, a person has to be facing the rain with the sun at your back. When we see a rainbow at night we are facing east and towards the rain. When we see a morning rainbow, we are facing west and towards the rain. In this part of the world, the clouds and wind mostly travel west to east, so rain in the morning from the west would eventually reach us. Very pretty. Note that the second rainbow is more faint, and the colors are reversed. 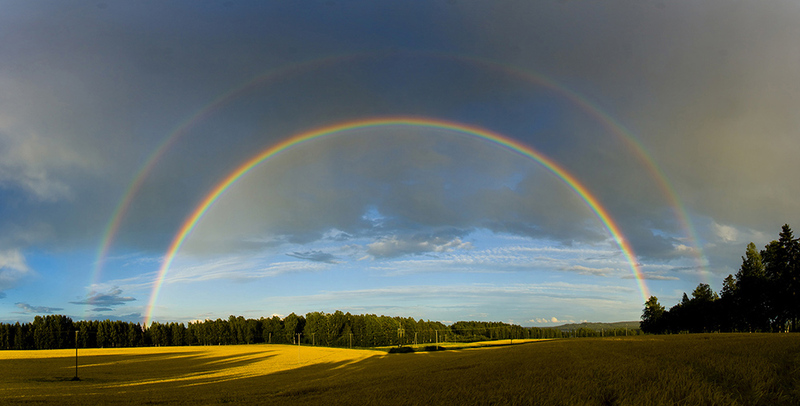 The secondary rainbow comes from two internal reflections with the rays exiting the drop at an angle of 50° rather than the 42° for the primary rainbow's color red. Blue light emerges at an even larger angle of 53° . This effect produces a secondary rainbow that has its colors reversed compared to the primary. Since the secondary rainbow reflects in the raindrop twice, it is not as bright as the primary rainbow. Talk about a major change of direction that last time. But three times in this passage, not because of anything he did wrong, but because God needed him somewhere, we saw God change Philip’s direction. We need to be open to God changing our direction to fit his needs. This appears as two rainbows of different arcs from the exact same base. Rene Descartes and most other scientists assumed that raindrops are spherical. While this can easily explain the rainbow and even the double rainbow, it cannot explain the twinned rainbow. Models in 2011, showed that actual raindrops flatten as they fall, due to air resistance. This flattening is more prominent in larger water drops. Such large drops end up resembling the shape of hamburgers, and are therefore called 'burgeroids.'" The twinning effect occurs when two rain showers of different sized raindrops combine. Each set of raindrops produces slightly deformed rainbows, which give us the twinned form. ...being of the same mind, maintaining the same love, united in spirit, intent on one purpose. Then we have the Sun smile. Rainbows are rarely seen in the winter, since you need rain, and in winter, we have snow. 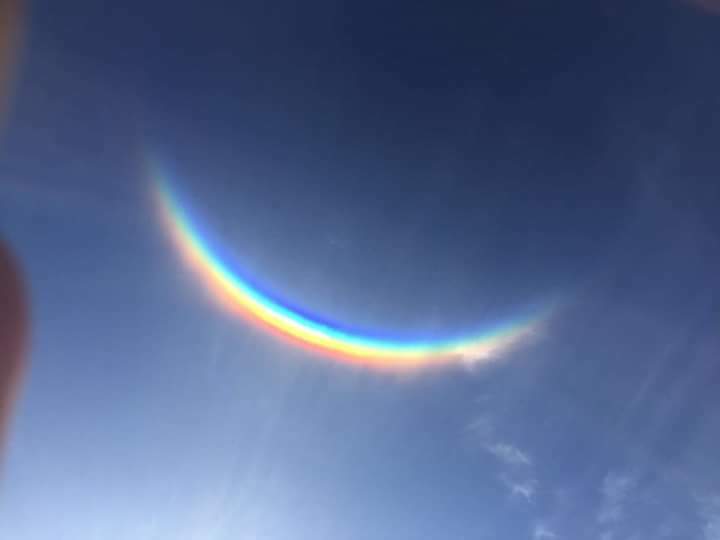 However, if the temperature is just right you can get ice crystals, and these form the Sun smile, an upside-down rainbow. Now faith is the assurance of things hoped for, the conviction of things not seen. For by it the men of old gained approval. And without faith it is impossible to please Him, for he who comes to God must believe that He is and that He is a rewarder of those who seek Him. This is caused by some rays of the sun canceling each other out through what is called destructive interference, causing that color to be erased in a narrow band. All of the different varieties of rainbows are awe inspiring. But did you know, we can’t see the full rainbow? More on that in a future devotion.